As I have said before, I don't charge anything for the resources I share online. Nor do I make any profit from this website. However, if you do use them - and do feel they are worth paying for - please could I ask you make a donation to a close friend's JustGiving page. At the end of July, Jon Jones is cycling with colleagues from Great Wakering in Essex to Paris (in France!) to raise money for Havens Hospices, an organisation and community which provided excellent care to his mother who passed away in April 2012. 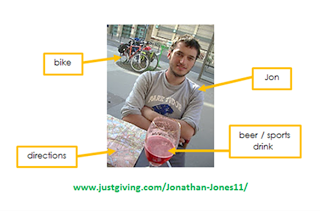 Of course, (most of) you won't know Jon and, all being well, probably won't encounter Havens Hospices - but maybe the best kind of giving is when we give randomly?